The ruling All Progressives Congress (APC) has said that the call by the reformed APC on Senate President Bukola Saraki to declare the seat of Senator Godswill Akpabio vacant was a comic relief. Reacting in a statement by its Acting National Publicity Secretary, Yekini Nabena, APC said that the R-APC lacks the capacity to make the call in the first instance. The statement insisted that the Senate President, having defected to the Peoples Democratic Party(PDP) must resign his position. The statement read: “We normally do not respond to the so-called, ‘Reformed All Progressives Congress (rAPC)’ because it is neither a duly-registered political party or a faction as it labours to sell to the public. 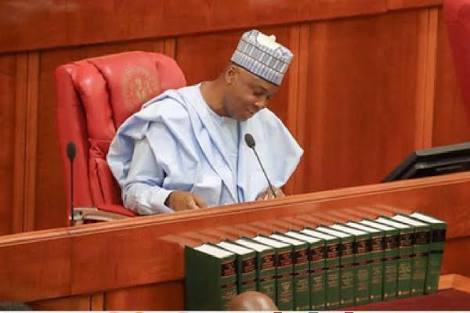 “The content of their statement particularly the request to the Senate President Dr. Bukola Saraki to declare the seat of Senator Godswill Akpabio vacant is a borrowed and scripted tactic – sensationalism and comical conspiracies – typically used by unknown groups to get media attention to their normally unserious activities. The statement should not be given any attention and credence.